How long does your water last? Blue Can offers a 50-year shelf life guarantee for its water products based on state-of-the-art manufacturing processes that meet or exceed standard FDA regulations and bottled water industry standards. FDA has established specific regulations for bottled water in Title 21 of the Code of Federal Regulations (21 CFR) that you can read here. The U.S. Food and Drug Administration, which regulates the quality and safety of bottled water, has neither set nor suggested any limitation to the shelf life of bottled water. In that regard, the International Bottled Water Association's general position is that as long as water is packaged in accordance with FDA processing and good manufacturing practices, 21 CFR, Part 129, and meets the FDA quality standard provisions as outlined in 21 CFR, Part 165, the product's shelf life should remain intact for an indefinite period provided that product storage is as recommended by the manufacturer. How is Blue Can Water purified? 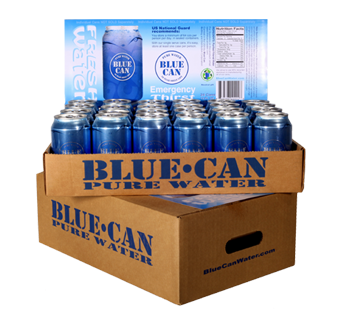 Blue Can Water is purified, disinfected, and sterilized to remove any chemicals or particles using a 12-step multi-stage process. This process includes using active charcoal filters, dual reserve osmosis under high pressure, six-stage micron traps, two sterilizers, high intensity UV lights, active pH balance, and ozone sterilization with state-of-the-art technology all preserved under pressure . What temperature do you recommend storing Blue Can? Temperature fluctuations do not change the quality of our water. It's recommended water be stored between 38 degrees Fahrenheit (2 degrees Celsius) and no higher than 145 degrees (55 degrees Celsius) Fahrenheit for best results. BCW has an ORP of approx. 430, according to the FDA Certified Lab. Deionization is not required. What is the can liner made of? Blue Can Pure Water is always at a neutral PH to prevent any corrosion of the epoxy coating inside the container. Is radiological testing conducted on the source water at least every 4 years? Radiological testing is done EVERY YEAR and no Radiological residue has been detected. Water analysis reports are performed by third party laboratories using procedures established by EPA, AOAC, APHA, AWW and WPCF. Extensive testing was conducted by an independent analytical NELAP Accredited Laboratory (Weck Laboratories Inc. ISO 17025, ELAP #1132, LACSD #10143, NELAC #04229CA) who certified that the test results meet all requirements of NELAC. According to the certified lab report, BCW meets all drinking water standards as established by the State of California Department of Health Services. Certificate of Analysis is available HERE. Additionally, do you provide have a guaranteed label or agreement on the shelf-life of the canned water? Click Here to view our Limited Warranty. What makes Blue Can Water so different? Our unique manufacturing process that allows water to be hermetically sealed and safely stored for 50 Year years. How long will the water last in the can? 50 Years if stored properly. Does the water taste metallic? NO the water does not have a metalic taste at all. There is a Non BPA epoxy coating inside of the can and both sides of the lid to protect the water from the aluminum. Is the water BPA Free? YES, Lab Certified. BPA Free Water, tested in the can. Click Here to Review our Water Report 2017. Can I leave the cans in my garage during hot weather? Yes, heat changes have been lab tested and do not affect the water inside. I have an expensive home water filter system. How is Blue Can Water different? Our water is filtered by the latest in modern technology multi-stage filtering and purification system to ensure the cleanest water possible. We like our water at room temperature and in a glass, does it go flat after sitting in a glass? NO, its just like any water. Aluminum is the ideal container for long term shelf life. In beverage cans it can be hermetically sealed (nothing can go in and nothing can go out), it has strength for stacking pallets and aluminum also never rusts (there is no iron in aluminum to allow rusting). Aluminum is a sustainable metal and can be recycled over and over again. A can is generally turned into a new can and back on store shelves within 60 days. Cans are usually available through curbside pickup or community drop-off locations nationwide. How do I prepare my aluminum cans for sale? Drain all liquid from the cans and bag or box. Cans do not have to be crushed. Can I get money for aluminum cans? Yes. Take them to your local recycle center. How do I get paid for my recyclables? Your recyclables will be separated and weighed and paid according to the market price for each item. Can aluminum cans be turned into schools or charities for fundraising? Yes. Some companies and organizations like Cans Count help schools and charities in need of funding organize recycling drives of aluminum cans. Check with local schools and charities to see if they are already participating in such efforts. How many aluminum beverage cans are in a pound? There are 34.21 cans per pound. How do I tell if my cans are aluminum? Check your cans with a magnet. A magnet will not be attracted to aluminum. Aluminum cans are also much lighter in weight than steel cans and aluminum will not rust. Do I need to separate my recyclables before selling? To serve you more rapidly, group similar items together, such as aluminum cans in one bag, plastic bottles in bags, glass in boxes, etc. Can I put foil in with my cans? No. Aluminum foil and foil pie plates must be kept separate from your cans and other aluminum. Wipe food from your foil and pans and bag for sale. Cans chill faster, colder to the touch on hot summer days, stack best, are the most recycled and recyclable container, lightweight and volume efficient, maintains freshness, protects content from light, tamper evident, long shelf life environmentally friendly, and rigid and unbreakable. Cans protect its contents to ensure uniformity of product quality. Your favorite beverage or canned food will taste the same whether bought in Oregon or Florida, Maine or California. Cans are also used to store fruits, vegetables, meats, fish and ready-to-eat meals giving us access to nutritious, even exotic, foods year round. What is the most recycled container? Aluminum cans by far -- not plastic or glass. The recycling of cans outpaced the recycling of all other containers. Aluminum cans lead the way with a recycling rate of 65 percent. Recycling pays and is a win-win for the environment and a sustainable society. Most plastic is not recycled; of collected plastic bottles less than 9 percent is actually recycled into new products. All aluminum cans are recyclable. 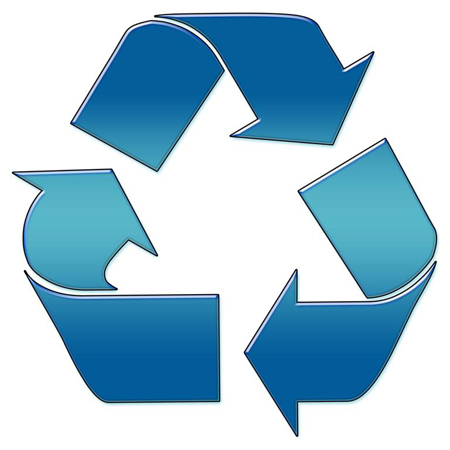 What is the most valuable container commodity in the recycling bin? The dollar value goes to aluminum cans. Aluminum is the only packaging material that it more than covers the cost of collection and re-processing for itself and subsidizes other containers including plastic and glass. How much money can be made by recycling beverage cans? How does $800 million paid by the industry to recyclers for their beverage cans sound? How do you prepare cans for recycling? Containers should be empty, clean and dry. Aluminum cans can be rinsed before recycling. What is the difference between closed-loop recycling and open-loop recycling? The closed-loop recycling process represents recycling at its finest-remanufacturing a product back into the same product-like an aluminum beverage can which can be recycled into a new aluminum beverage can endlessly. Plastic is an open loop, recycled plastic cannot be used to make new plastic bottles, the plastic is contaminated. So a new plastic bottle is made of zero percent recycled plastic. A new aluminum can is made of up an average of 45-70 percent recycled aluminum. What are some of the benefits of recycling aluminum cans? Recycling one aluminum beverage can save enough electricity to: power a TV for three hours, or a 100-watt light bulb for four hours. Recycling 40 aluminum beverage cans has the energy-saving equivalent of one gallon of gasoline. It takes 95% less energy to recycle aluminum than to start at the beginning mining the bauxite. Recycling that beverage can reduce effluents and emissions by 95 percent creating a more sustainable future. When was the first canned soft drink manufactured? Cliquot Club ginger ale was the first canned soft drink debuted in 1938. Delivering the soda was a cone top can produced by Continental Can Company. Design improvements continued and in 1948 Continental Can and Pepsi-Cola launched the first major rollout of soft drinks in cans. The can carried 12-ounces of refreshment and sold for ten cents. When and what company introduced a twelve-pack of cans? Twelve-packs were first introduced in 1972 by Pepsi-Cola, delivering more volume, more efficiently to consumers. Since then, thirsty consumers have the option of buying cans packed in multiples of 4, 6, 12, 18, 24, and 36 cans. When did vending machines start serving canned soft drinks? Canned soft drinks were first dispensed in vending machines in 1961, joining glass bottle and paper cup machines, and by the late 1960s canned soft drinks dominated the vending market. Is it my imagination or is the beverage can getting lighter in weight? Through industry source reduction, aluminum beverage can continue to become lighter in weight. There are 34.21 beverage cans to a pound. Compare the 2006 number of cans per pound of aluminum to 1972 when one pound of aluminum yielded 21.75 cans. The first two-piece aluminum cans weighed three ounces, while they now weigh less than one-half ounce. Even the can ends have been made lighter: ends used to weigh about 8.12 pounds per thousand and have been reduced to a mere 6.07 pounds per thousand. This may not seem like much of a difference, but multiplied by the 100 billion cans that are made each year, the weight savings is a phenomenal 200 million pounds of aluminum. Technology and aluminum make it possible to use less and still deliver the quality product you deserve and expect. When did canned beer enter the market place? The first can of beer was sold January 24, 1935 in Richmond, Virginia. It was brewed by Kreuger Beer and came in a steel can made by the American Can Company. This tall cold one flat or punch top can required a can opener. By August of that year, Pabst had become the first major brewer to add canned beer to its regular product line. In September 1935 Schliltzlager and Heilman Lager introduced the cone top can made by the Continental Can Company. Is a steel can the same as a tin can? Tin cans have been replaced by tin-free steel which is given a thin tin coating, usually as thin as a human hair, to prevent rusting. Protective coatings applied to the inside of the cans ensure the integrity of the contents and have allowed cans to hold many products, such as acidic fruits, which would otherwise be too corrosive. Technologies for both tin-free steel and aluminum have added even more flexibility and versatility to today's can. Where can I find the nearest recycling center? There are approximately 2,000 certified recycling centers in California. Call 1-800-RECYCLE or visit our online recycling center locator to find the certified recycling center nearest you. What other recycling options are there? In addition to a certified recycling center, consumers can donate recyclables to a community service program, a drop-off or collection program, or a curbside recycling program. As with recycling centers, these programs are operated by independent businesses or local governments, not the State of California. How much do recycling centers pay per pound for cans and bottles? Currently, state certified recycling centers pay a minimum of $1.57 CRV for aluminum cans; $1.00 CRV for clear PET plastic bottles; $0.57 CRV for HDPE plastic bottles (similar to the large water jugs); and $0.105 CRV for glass bottles. These per pound CRV rates fluctuate annually usually taking effect the first day of the year. In addition to the CRV, recyclers may also pay a scrap value, which may also fluctuate. Can recycling centers pay less than the refund value for redeemed containers? Yes, if the material is contaminated. Operators of certified recycling centers must inspect each load of containers to determine whether it is eligible for CRV. Recycling centers have the option to refuse to accept containers which, in their opinion, are excessively contaminated with dirt, moisture, or other foreign substances. Alternatively, recycling centers may adjust downward the CRV per pound used to calculate the payment by the ratio of such substances to empty beverage containers. In this circumstance, the consumer has the right to accept the discounted refund and/or scrap price, to separate refund from no refund material, or to take the material back. How do I know that the scales at a recycling center are accurate? Certified recycling centers are not official "weigh masters." However, they are required to weigh materials that have been presented for redemption on a scale or other device that has been properly approved, tested, and sealed by the local county department of weights and measures. During inspections and onsite visits, CalRecycle personnel verify that recyclers' scales bear proper seals. It is unlawful, and punishable as a misdemeanor, for any person to use for commercial purposes a scale that is "incorrect." Suspected violations should be referred to the appropriate county department of weights and measures, which are ultimately responsible for ensuring the accuracy of recycling center scales. How do recycler's account for the weight of buckets used during the weighing process? Typically, recycler's "zero" their scales with the bucket on them prior to weighing redeemed materials. Alternatively, recyclers may mark the outside of each bucket with its weight, then deduct that weight from the scale measurement. Do I need to crush my cans? Generally, no. However, requirements about the condition of beverage containers are established by the recycling center and may vary from one recycler to the next. Therefore, you should contact the recycling center where you plan to take your containers to determine its requirements. Are recycling center operators State employees? No. The owners and employees of recycling centers are not State employees. CalRecycle is responsible for certifying recycling centers to participate in the program. This certification does not confer any "state" employment status.